I was at TCAF (Toronto Comics Arts Festival) this past Sunday, wandering around looking but not really interested in the things I was passing when I came to an abrupt halt! It was the artwork I noticed first, (which is why it’s a comic arts festival) I had seen it before on the web and remembered it immediately. It is one of those art styles I am drawn too (no pun intended). Of course the book was Shi Long Pang, the Wandering Shaolin Monk. I came across this comic on the web before and remembered just loving the art. I can only guess the reason for me not diving in and reading the archives when I first discovered it is because I have two kids in diapers, and time to go through a comic archive is limited to say the least. Also I was hesitant only because it seemed like everything I wanted in a comic, art I loved, and a subject I loved, but I was afraid to be disappointed by the story. Now here I was at TCAF and there was the book in beautiful hardcover right in front of me, I stopped, picked it up and bought it with a hope the story would be good. It was everything I hoped it would be and more. The author Ben Costa intertwines fiction and history wonderfully, with great footnotes to educate the reader. I love the tidbits of history brought into the story, a history that is fairly unknown to the western reader, that Costa explains making context easier to understand, which I appreciated. Costa does make the reader work and you do have to pay attention, but that is just another thing that is great about this book. I’m a shy guy, but I did find myself babbling a bit to Ben as he signed my book, something I didn’t expect cause I have never bought a book from an artist before. He was nice and gave me a great picture of Pang in my book, great stuff! I couldn’t recommend this book more highly. 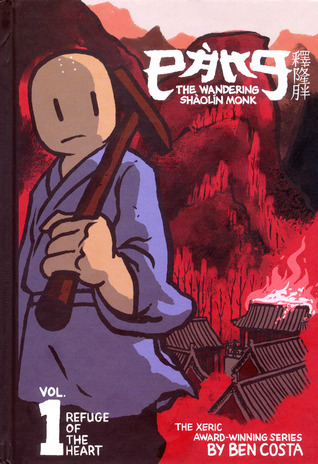 It’s rare to find a comic that exceeds expectations, and Pang the Wandering Shaolin Monk does this with ease. Also it’s nice to read a graphic novel that doesn’t take 10 min to finish, I mean it actually takes a long time to read and when I started to get near the end I was really sad that it would be over. Thank goodness there is more coming!